Dark, oppressive, moody – Mockingjay Part One reflects our times in more ways than one. I am not entirely sure the teen audience will see the symbolism or connection to the devastation in Syria or the use of propaganda by IS to whip up hatred for all other faith versions except theirs – but that’s what we are getting here. Katniss is a wreck. 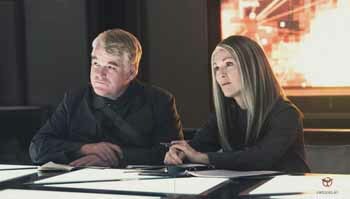 Literally plucked from The Hunger Games by Plutarch Heavensbee (the late Philip Seymour Hoffman lending his expressive eyebrows to the movie) she is now recovering in the bowels of District 13. This is an underground fortress run by President Coin (Julianne Moore in a scary haircut) and this is a great secret kept from the all-powerful President Snow (Donald Sutherland honing is truly evil persona). They want Katniss to be the visible spokesperson for the rebellion. She is reluctant and awkward. Only when she finally gets to see the ruins of her own District 12 does she finally realise what the stakes are and when filming in District 7 she comes awake with the true horror of the regime and finally takes action. The film is a moody exploration of psychological damage, the limits of propaganda and a blueprint for revolution. It takes its time and with Peeta clearly being used for counter propaganda by President Snow, it is a battle of wits as much about the weapons they may or may not have. It is dark and necessarily so, but one wishes some the younger players had more personality. It’s brave (or foolish) to inflate the final volume of Suzanne Collins final book in the series. It lends it an importance that perhaps it didn’t have. I am not sure audiences will go back for repeat viewings as they did with the previous two. After all this isn’t The Hunger Games, teen killing teens. This is the first stage in all out war and the film has to rely on Jennifer Lawrence (who is always watchable) and the stalwarts, Woody Harrelson (playing it sober) Liam Helmsworth (as Gale) who to be honest is just a pretty face and the arresting newcomer Natalie Dormer (Cressida) making a movie within a movie. Philip Seymour Hoffman lends credibility to the whole enterprise and will be hard to replace – one hopes all his scenes are completed for Part Two. The visuals are strong. War is hell. Part Two has to be more engaging and about taking the battle to the Capitol and President Snow. 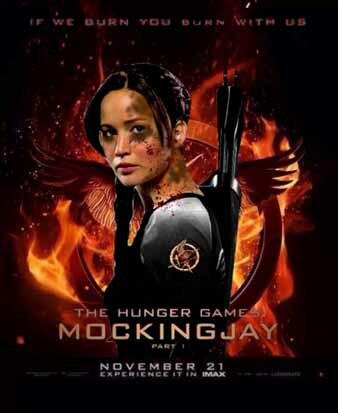 I guess we will have to wait and hope that Katniss can hold it together until then.